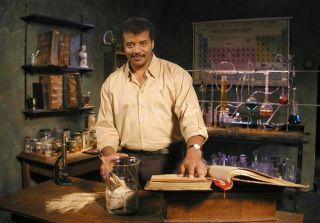 Neil deGrasse Tyson, host of NOVA's four-part miniseries "Origins," researches the recipe for life. Providing television viewers a solid primer on everything from the birth of the universe to the variety of life in New York City's Times Square may seem like a daunting prospect, but a new miniseries to appear on the Public Broadcasting Service (PBS) succeeds in its attempt. It seems four is the magic number for NOVA: Origins (PBS, Sept. 28-29 at 8:00 p.m. EDT), a four-hour, four-part series that producer say was four years in the making. Each hour tackles a different area of cosmic evolution, starting with the formation of the Earth and planets, then leading onward to the rise of life, the search for extraterrestrial lifeforms and the beginning of the universe. Hosting the series is astrophysicist Neil deGrasse Tyson, director of the Hayden Planetarium at the American Museum of Natural History (AMNH) in New York City. "[Origins] addresses questions that have been with us since the beginning of culture," deGrasse Tyson said during a Sept. 22 preview at the American Museum of Natural History in New York City. "And that is: How did it all get here, and are we alone?" Taken as a whole, the Origins series offers a clear window into current astronomical research form even the most diehard non-scientist using practicing researchers, animations and analogies as guides. The diversity of life, the series demonstrates, runs from tiny microbes to Times Square's Naked Cowboy. Researchers are found probing the universe atop the Chilean mountains and traipsing deep within the Earth for hardy microorganisms. "We tried to make this as accessible as possible," Origins executive producer Tom Levinson, stressing that he hopes viewers see their direct connection with the lives of stars, which provided the material that led to the solar system, Earth and humans. "We wanted to ground our series in the work of scientists doing active investigations." Origins producers save their most science-heavy subject, the concept of the Big Bang and the discovery of the cosmic microwave background, for last, which can be trying for some viewers. But the focus on practicing astronomers, especially a pair of researchers who stumble onto the cosmic microwave background after sweeping pigeon poop from the insides of their telescope, keep the pace moving. NOVA: Origins will appear on PBS on Sept. 28-29 at 8:00 p.m. EDT. (Check local listings).